A Larne man has been remanded in custody after being accused of attempting to murder a family when shots were fired at a house in the town in the early hours of Monday. 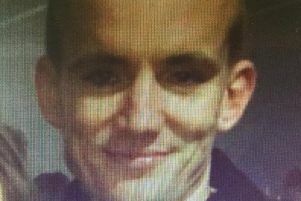 Jonathan Colin McCormac (30), of Wellington Green, appeared in handcuffs in the dock whilst wearing a grey tracksuit at Ballymena Magistrates Court on Wednesday morning. A court clerk read out 10 charges, one of which accused the defendant of the attempted murder of ‘James and Aislinn Hassin and family’. The family’s home was attacked around 2am on Monday and included a shot being fired at a bedroom window were three children, aged 10, seven and three, were asleep. Shots were also fired into the hallway, and a car was set alight and destroyed. No-one was injured in the attack. Arising out of the incident, McCormac was also charged with carrying a sawn-off shotgun with intent to commit an offence; hijacking a Volkswagen Bora car in Larne and aggravated taking and causing damage to the vehicle. He was further charged in relation to other incidents including the attempted aggravated burglary of a house with intent to commit grievous bodily harm on a male at Ardnaglass Gardens, Antrim, on August 18 this year. He is also charged with possessing a sledge hammer as an offensive weapon and causing criminal damage to a Volkswagen Golf car belonging to Mr Russell. McCormac is also accused of offences on August 29 this year including causing criminal damage to a Peugeot Partner van belonging to another malel. He is charged with causing criminal damage to a Vauxhall Zafira vehicle belonging to a female on the same date. Also on August 29, he was accused of possessing hand tools as offensive weapons at Victoria Road, Larne. A police officer said he believed he could connect the accused to the charges and he opposed bail. The officer said there had been “ongoing tension” in Larne in recent months which had been continuing since April this year which included assaults and attacks on properties and vehicles. The policeman said Monday’s attack was “linked to ongoing tensions between loyalist paramilitaries and Mr Hassin”. The officer said police believed McCormac was linked to purchasing a vehicle in which four masked men arrived at Ardnaglass Gardens in Antrim on August 18. Referring to Monday’s incident, the officer said a vehicle was stolen in Larne around 1.40am when two people armed with sawn-off shotguns held a shotgun to the victim’s head warning that if the police were contacted “we know who you are, and we will be back for you”. A short time later a vehicle was driven into the garage of a house at Brustin Brae Road, Larne, and shots were fired. The officer added: “One of the windows shot was the bedroom of three young children sleeping inside”. The officer said the occupant, James Hassin, identified McCormac, who was allegedly wearing a balaclava, “by gait and build and the shape of his head” as he had known him for five years. The officer said a vehicle was later found burnt out and a footwear mark found beside the vehicle was similar to footwear worn by McCormac. The policeman said two sawn-off shotguns, shotgun cartridges and a crowbar were recovered behind garages at Drumahoe Gardens. close to the defendant’s home. The officer said a relative of Mr Hassin’s wife had her car set on fire on Tuesday night. The policeman told the court: “It seems to be, any associate of Mr Hassin is being targeted.! The officer told the court McCormac declined to give any account of his movements to police. Defence barrister Aaron Thompson said the case against his client was “circumstantial” and he said it appeared there was little evidence against the defendant other than a “heavy set man” being identified. He said no bail address outside of Larne was available. A prosecutor lawyer claimed police had established a “course of conduct” between all the incidents. Refusing bail, District Judge Peter King said he dealt with cases from Larne every week and he was aware of the situation in the town. He said the only prospect of McCormac getting bail would be an address well outside of Larne. Judge King said McCormac being released to a bail address in Larne “may not be good to his health and the health of others”. McCormac was remanded in custody to appear back at Ballymena Court via video link on October 5. Meanwhile, a 30-year-old woman has been charged with attempting to pervert the course of justice linked to the incidents on Monday and will appear in court next month.